Do you ever get anoyed by the fact that you have to open and close several windows and tabs to see and edit your IP configuration? The drop down box shows all the network boards with AdapterTypeId 0 (ethernet 802.3). This makes it easier to search WMI for a specific board. but that resulted in throwing an error when the script hit the properties subkey which we don't have acces to. I overcame this problem by getting the indexId so I could open the desired key. I also wanted to find the speed and duplex settings. Again I stumbled into the problem that every manufacturer has it's own way of storing that setting. The value or Itemproperty name is named different for every vendor. So I created a loop to search for the one thing I believe they have common. The name "auto". and "full". Once found the path is stored into a variable. After storing I stripped the last subkey to get the keyname which is the same name as the value name that needs to be changed. Now we can read the Itemproperty value and search for the corresponding setting. In fact his is the second script I ever wrote using powershell and I'm aware that the code can be written more efficently. Please feel free to change it but please keep me updated on the changes as I would like to learn from it. I am working on support for remoting hence the button select server. This option is not functional yet. Feel free to help me out on this one. #This function runs after pressing the CHANGE key. $DNSservers += $item + ","
$strdnssearch += $item + ","
#determine the length of the a variable and add 0 accordingly. $tLoc.Text = "Virtual NIC: no locationinfo"
$cbspeedduplex.text = "No speed/duplex setting available"
$NIC = Get-WMIObject -Query "Select * From Win32_NetworkAdapterConfiguration where index = $indexnum"
#tell WMI that we are going to use static addresses and set IP address and default gateway. $statusbar1.Text = "Cancel pressed... Nothing written." $server = Read-Host -Prompt "Please enter the servername to work on...."
Enter-PSSession -ErrorVariable PSSessionError $server -Credential ""
$statusbar1.Text = "Use this field to add, remove or edit DNS name server entries. 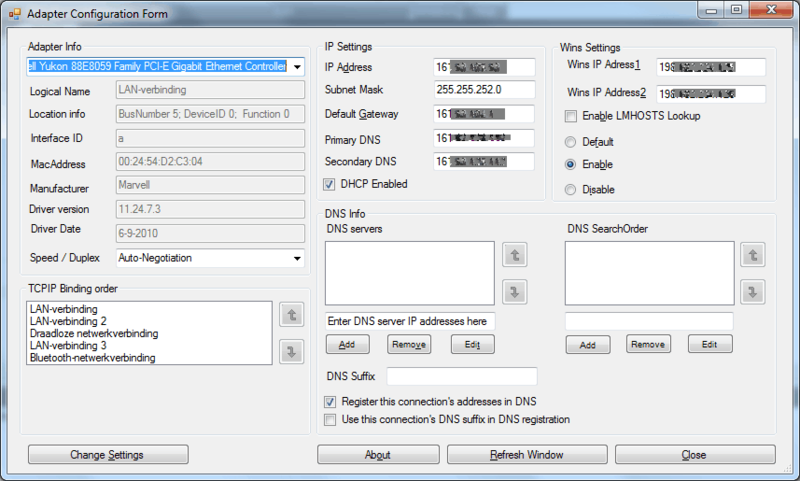 (You have to select an entry before you can edit or remove)"
$form1.Text = "Adapter Configuration Form"
$tDNSadd.Text = "Enter DNS server IP addresses here"
$checkbox2.Text = "Use this connection's DNS suffix in DNS registration"
$checkbox1.Text = "Register this connection's addresses in DNS"
$groupbox5.Text = "TCPIP Binding order"
$label14.Text = "Speed / Duplex"
$cb1.Text = "Select a board to inspect"
$checkLMH.Text = "Ena&ble LMHOSTS Lookup"
$label6.Text = "Wins IP Adress&1"
$label7.Text = "W&ins IP Address&2"